Start by preheating the oven to 325 degrees. Line a 9 x 13″ baking pan with foil (parchment paper also works), and spray the foil with non-stick cooking spray. Begin with the cookie base. Ideally I would have used a food processor, but considering I’m a 22-year-old living in NYC, my TINY kitchen seriously doesn’t have the space to fit any gadgets (I don’t even have a microwave!). So instead I just melted my butter, and added it to all the dry ingredients.Lightly mix ingredients until it just starts to hold together like a dough. Press the dough into the prepared pan, and prick thoroughly with a fork. Bake for 25 minutes (until lightly browned). Let this cool fully. For the Billionaire filling, heat the butter, brown sugar and condensed milk over low heat in a heavy sauce pan. Let the mixture lightly simmer, and stir constantly until it thickens and becomes a medium caramel color (about 20 minutes..yes it’s an arm workout). Remove from the heat, and stir in the vanilla. Pour the filling over the cookie base, and spread evenly. 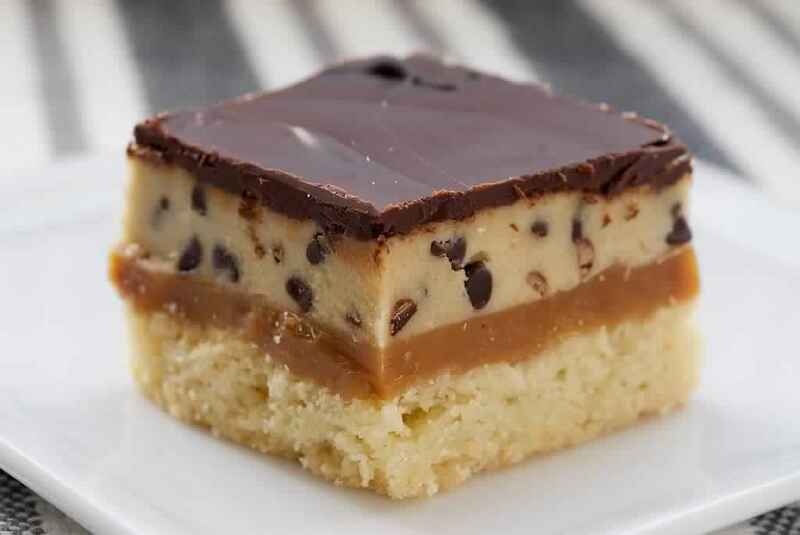 Let this cool completely before adding the chocolate topping. To make the Billionaire topping, heat the the chocolates separately (using a double boiler). Drop spoonfuls of each chocolate over the caramel topping, and use a sharp knife to lightly drag lines of melted chocolate all over the top. Let the bars sit in the refrigerator, until the chocolate becomes firm. Before cutting them, allow them sit out at room temperature for about 20 minutes, so that the chocolate layer wouldn’t crack when cut.